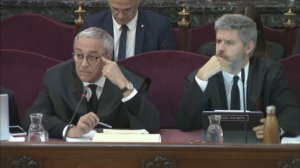 Spanish law enforcement officers from the National Police testified on the 29th day of the Catalan Trial – and, as their colleagues had done the day before, spoke of violence from Catalan voters on 1 October 2017. One Spanish police officer also told the court of spotting Catalan police (the Mossos d’Esquadra) leaving a school and entering a car that was owned by the Catalan government. ‘All of our suspicions on the Catalan police were confirmed in that moment,’ he explained. One officer from the Joan Boscà polling station alleged that some citizens wore ‘two motorcycle helmets on each arm,’ allegedly to attack law enforcement. ‘We suspected they knew that we were coming,’ the witness added. Defence lawyers Xavier Melero and Andreu Van den Eynde listen to witnesses on 10 April 2019 at the Supreme Court. The witness spoke of leaving the polling stations being ‘the most difficult part’, recalling voters hitting police vehicles, even ‘punching’ the cars, as well as rocks and glass bottles being thrown and hearing insults such as ‘animals’ and ‘fascists’. Another officer, acting as surveillance during the referendum, said he saw voters carrying ‘sticks, helmets, and chains.’ Although he perceived ‘a violent attitude’, he denies seeing any concrete act of violence. Another still said on the stand that it was ‘dangerous’ for Spanish police officers to enter polling stations on referendum day, alleging that voters were blocking the entrance and shoving them when trying to seize referendum material. The actions of the Catalan police were again called into question in the morning proceedings. One Spanish police officer, when cross-examined, said that no joint operation with the Catalan police was considered when deciding what polling centres to act on.